Easy. Mostly downhill or flat from Toblach to Villach and then climbs gently to Tarvisio. Mostly traffic-free cycleway with short stretches on quiet roads. Mixed - mainly tarmac-surfaced cycleway or road, but there are some shortish sections of unsur­faced track. 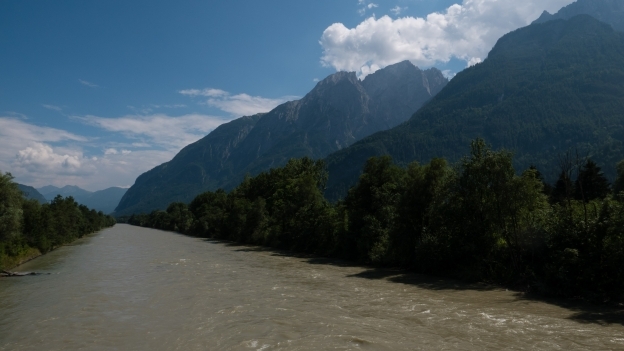 This route takes the Drauradweg cycle route from Toblach (Dobbiaco) in Italy to Lienz in Austria, and then following the Drau (Drava) river on to Villach where it turns back towards Italy and Tarvisio. 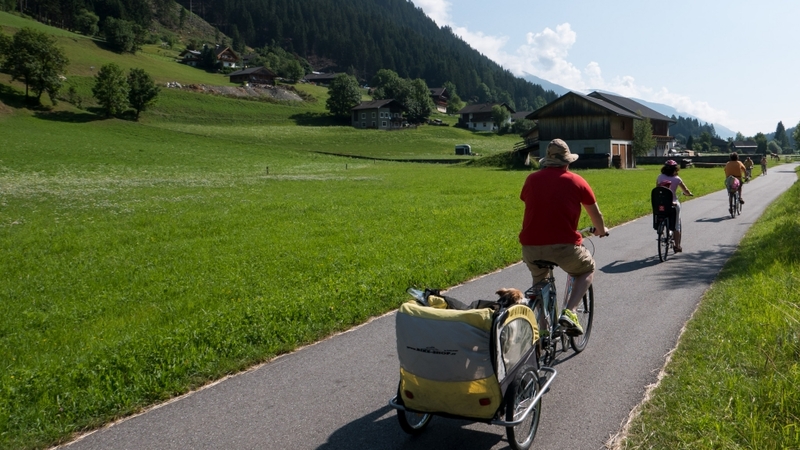 This route is will also be of interest to anyone planning a long-distance tour because it provides a link between the networks of cycleways in the Südtirol, the Austrian Tirol, Friuli Venezia Giulia region and Slovenija. 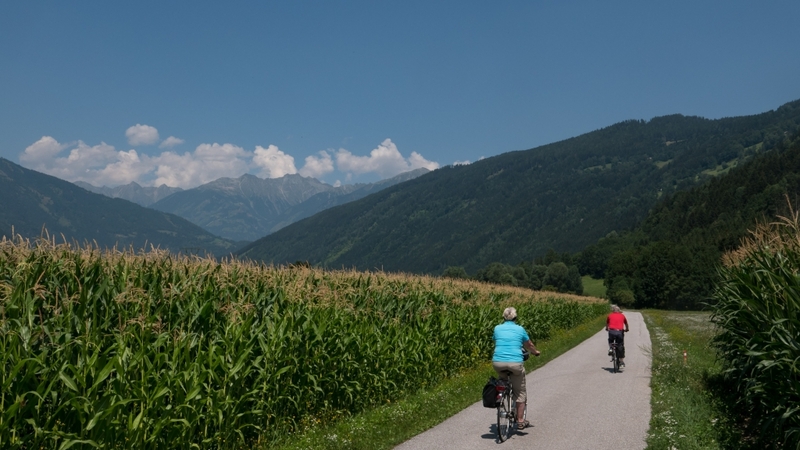 It's worth consid­ering whether you're looking for a route that combines more than one country - or simply a convenient link between the Pusterbike cycleway in the Südtirol and the FVG1 (Ciclovia Alpe-Adria Radweg in Friuli Venezia Giulia). See the options and connec­tions section below. 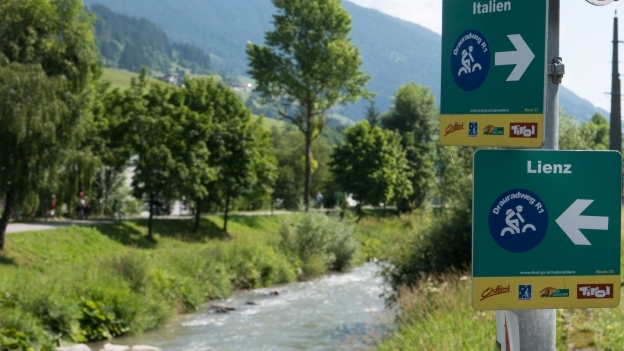 The route connects with the Ciclovia Alpe-Adria Radweg at Spittal an der Drau (the CAAR starts in Salzburg). It follows the CAAR as it crosses the border and continues towards Tarvisio. From Tarvisio the CAAR heads south towards Udine and then Grado at the coast. 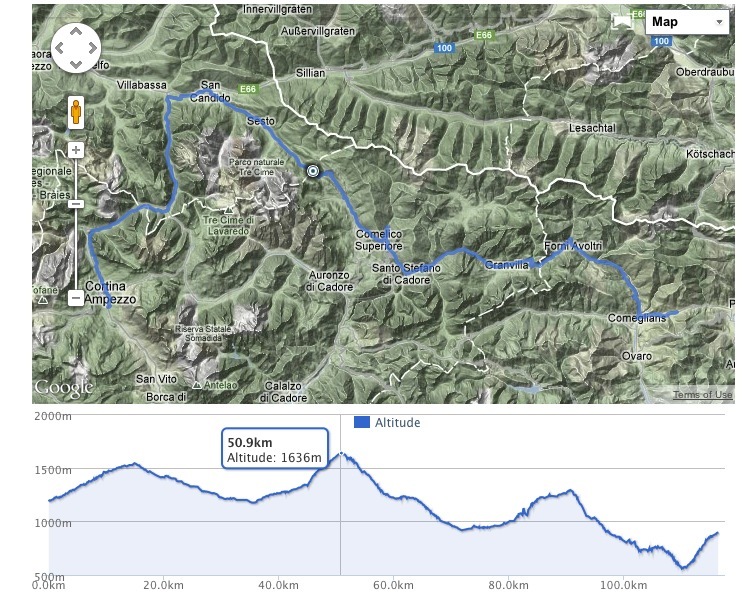 As an altern­ative from Tarvisio to Kranjska Gora and follow the Alpe-Adria Bike through Slovenija and on to Trieste and then follow the Adriatic Coast. 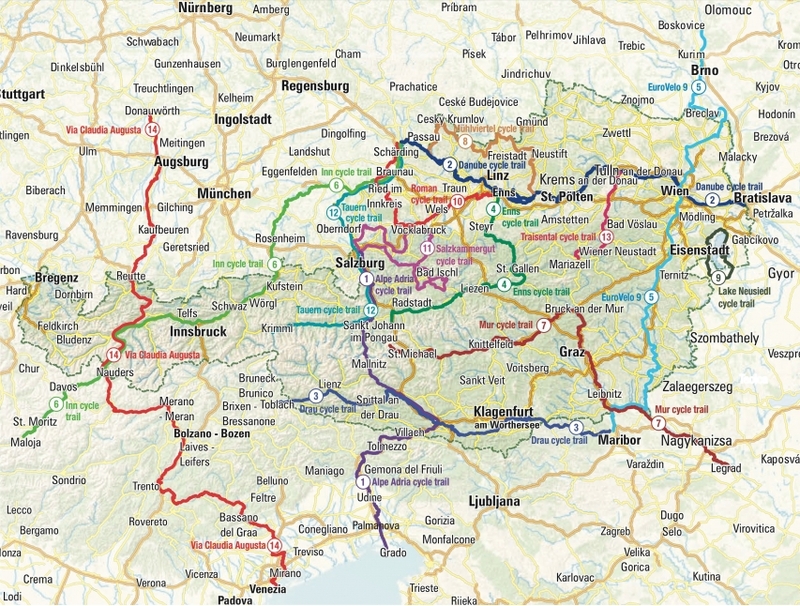 Both the CAAR and the Alpe-Adria Bike join up with the eurovelo 8 which offers a route along the Adriatic coast - either west towards Venezia or east towards Trieste, Slovenija and Croatia. 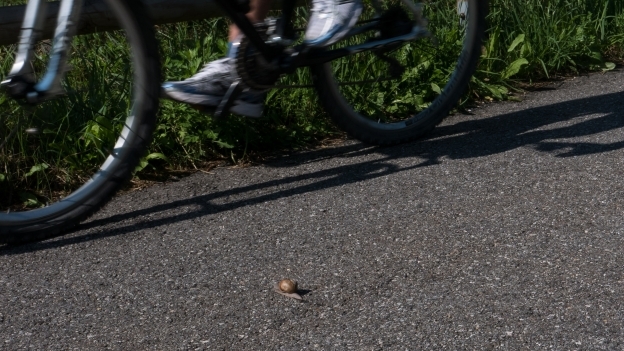 At its northern end the Drauradweg meets the Pusterbike cycle route which follows the valley of the Puster river. At Fortezza Franzensfeste it meets the cycleway that heads south from the Brenner pass on the border with Austria, towards Bozen (Bolzano) and onwards to the lago di Garda and Verona. At Toblach (Dobbiaco) there's the junction with the Ciclabile delle Dolomiti which goes via Cortina d'Ampezzo to Calalzo di Cadore in the Veneto. The ciclabile delle Dolomiti forms is part of the München-Venezia ciclabile (Munich-Venice cycle route). 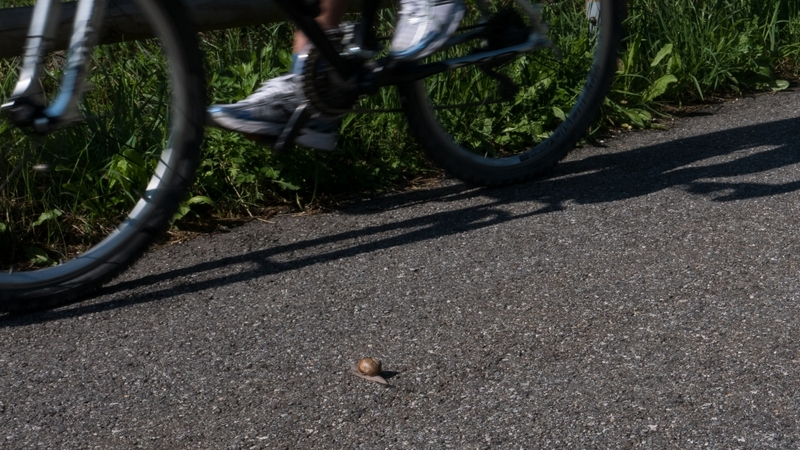 The Drau cycleway continues to Maribor in Slovenija. The zip files contain pdf files packaged together for convenience. If you are using a tablet you may find it easier to download the individual sections. The maps are in two versions: A4 portrait format - for printing and maybe also for viewing on an iPad, and A5 for smaller tablets and smart­phones. (A4 and A5 are inter­na­tional paper sizes). Links open in new windows unless you ‘save as’ etc. POIs are like waypoints, but while you can usually only store a limited number of waypoints on a device, you can store thousands of POIs. These files include inform­ation about campsites and hostels, bike shops, train stations, drinking water sources as well as warnings for tunnels and roads where bikes are banned. Please check the ReadMe file for instruc­tions. Updated April 2018. The file format is only compatible with Garmin GPSes . There are about a dozen campsites along the route. I've stayed at, and would recommend, the Camping Toblachersee on the lake near Toblach (Dobbiaco) and the Camping Draufluss which is on the branch of the route that goes via Baldramsdorf. the Jugendhotel Egger ('Youth Hotel') in Landskron near Villach. 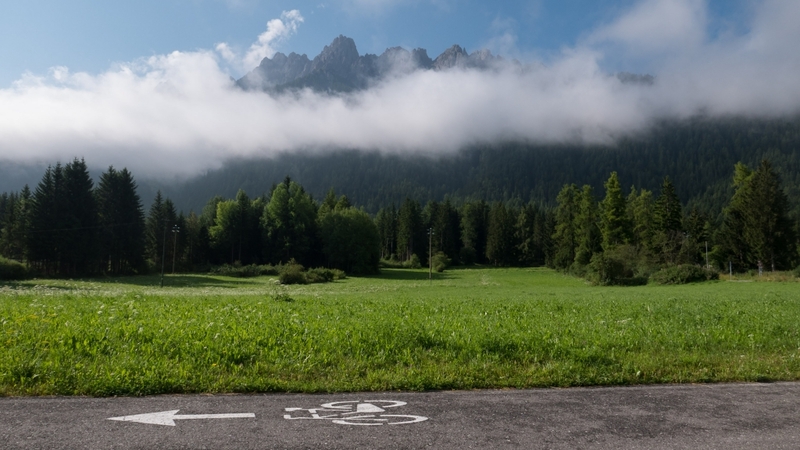 There is also, in theory, the Ostello del Ciclista at Fusine north of Tarvisio on the FVG1A as it heads for Kranjska Gora. There are signposts for the hostel from the route, but I haven't been able to find any contact details or inform­ation. Otherwise there's the Hostel Barovc at Kranjska Gora, and the Casa Alpina Julius Kugy at Valbruna a short way further on from Tarvisio. You are never very far from a train station on this route. The main rail hubs are Lienz and Villach. Toblach station is served by the SAD regional train company which operates services between Fortezza Franzensfeste and Lienz. At Fortezza Franzensfeste you can connect with the national and inter­na­tional train network. The nearest airport is Klagenfurt but it offers only a limited range of destin­a­tions. Ciclovia Alpe-Adria Radweg: (app name: "Alpe Adria Biketour") iOS version and Android version ). 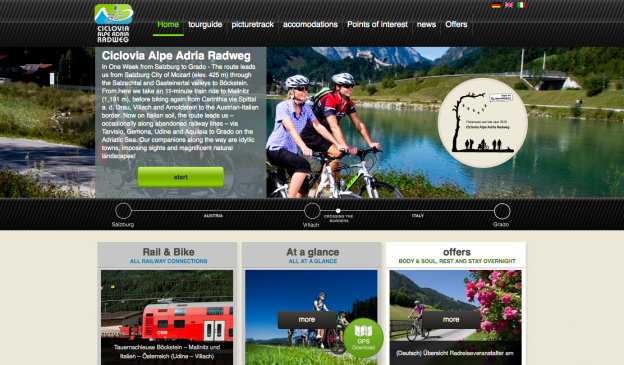 If you're looking for inform­ation about cycling in the Kärnten (Carinthia) region then there is a very useful tour planning resource at touren.kaernten.at which includes (for example) the inter­esting-but-challenging Drei Laender Tour (three countries tour) which takes in Austria, Italy and Slovenija.